The Backup Exec Archiving Option is no longer supported for Backup Exec 15 Feature Pack 1. You cannot upgrade the computer to Backup Exec 15 Feature Pack 1 until you remove the Archiving Option. Backup Exec has detected that the Backup Exec Archiving Option is installed on this computer. This option is no longer supported by Backup Exec. You cannot upgrade this computer to Backup Exec 15 Feature Pack 1. You must remove the Archiving Option before you can continue with the upgrade. Backup Exec has detected that the Backup Exec Archiving Option is installed on the following managed Backup Exec servers. This option is no longer supported by Backup Exec. You cannot upgrade this computer to Backup Exec 15 Feature Pack 1. You must remove the Archiving Option before you can continue with the upgrade. You must remove the Archiving Option by using either Add/Remove Programs, or by using the option Install Options and Licenses on this Backup Exec Server on the Backup Exec Administration Console. Before you uninstall the Archiving Option, perform the following procedures. Restore any archived file system data or Exchange data. ​​These folders can be used if you purchase and install Enterprise Vault. All archive-related jobs display a status of Disabled. You cannot run, edit, or save a disabled job. We recommend that you delete all archive-related jobs. Save the audit logs that are in the Archive category to a text file by using the following steps. Note: These logs are not available after you install Backup Exec 15 Feature Pack 1.
a. Start the Backup Exec console, and then click the Backup Exec button. b. Select Configuration and Settings, and then select Audit Log. c. Select Archive in the drop down menu, and then select Select category to view. d. Click Save Log to File to specify a file name and location to save the audit log entries. Note: Archiving Option-related reports are not available after you install Backup Exec 15 Feature Pack 1.
a. On the Reports tab, under Reports Group, click See Completed. c. Double-click a completed Archiving Option-related report that you want to save to a new location. d. Enter the file name and location where you want to save the report. e. In the Save as type box, select a format in which to save the report, and then click Save. Supported formats include HTML files (.htm), Adobe PDF files (.pdf), XML files (.xml), comma-separated value files (.csv), and Microsoft Office Excel workbook files (,xls). When you save a report in HTML format, both the HTML file and a GIF image file are saved. You can use the Installation Wizard to remove the Backup Exec Archiving Option from the local Backup Exec server. All corresponding files, registry keys, and configurations are removed. Click the Backup Exec button, select Installation and Licensing, and then select Install Options and Licenses on this Backup Exec Server. 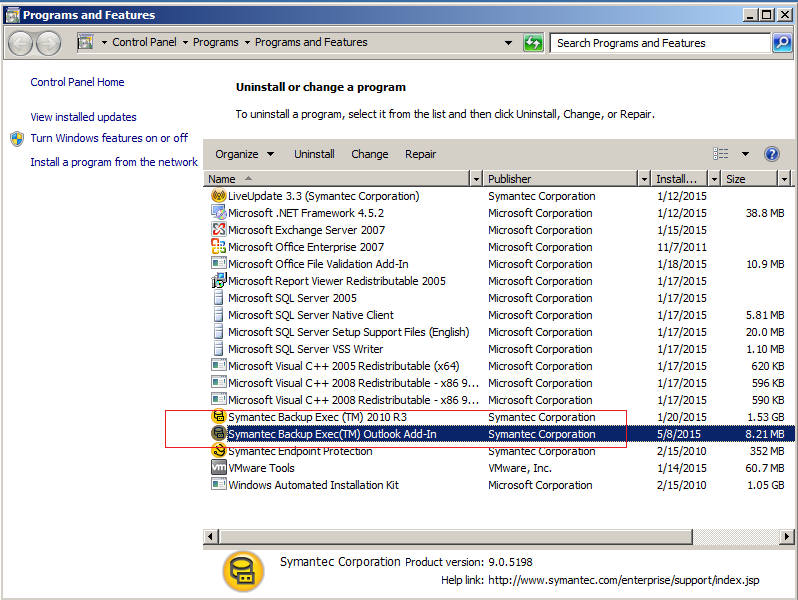 On the Add Licenses panel, in the Activated Licenses list, select the item that you want to remove, click Remove Serial Numbers, and then click Next. On the Review Licenses panel, uncheck the check boxes for the licenses that you want to remove, and then click Next. On the Configure Options panel, verify that the Exchange Mailbox Archiving Option and the File System Archiving Option are not checked, and then click Next. Clear the check box for the language that you want to remove, and then click Next. If you are prompted to enter credentials for the Backup Exec service account, type the correct credentials, and then click Next. Read the installation summary, and then click Install to start the process. When the Installation Wizard completes, click Finish. After you install Backup Exec 15 Feature Pack 1, note the following information about the Backup Exec Archiving Option. For Backup Exec 15, a Remote Administration Console that uses a previous version of Backup Exec cannot be used with a Backup Exec server on which the current version is installed. For example, a Backup Exec 15 Remote Administration Console cannot manage a Backup Exec 15 Feature Pack 1 Backup Exec server. For Backup Exec 15 Feature Pack 1 or later, a Remote Administration Console can manage a Backup Exec server that runs a different Feature Pack level. Archiving Option jobs are reported as a type 'Unknown'. You can manually remove the job history and store the job logs if appropriate. All of the Backup Exec Archiving Option-related jobs, such as Restore from Archive, Delete from Archive, and Archive Stages, will be deleted. Audit logs in the 'Archive' category will be automatically saved in the installation directory, in the Data folder. The name of the file is ArchiveOptionAuditLog.txt.